These budget friendly outdoor living space ideas help you design a hub of summer entertaining. With summer comes the outdoor entertaining season and the need for a beautiful space. Outdoor living spaces have become more detailed and extravagant recently with everything from fountains to ceiling fans. However, you don’t need to pour your life’s savings into your backyard to create the perfect space for outdoor entertaining. No matter what plan you have for your budget friendly outdoor living space, you need a beautiful finished area as a foundation. These are typically either a deck or a patio. While refinishing or building a completely new structure may sound like an expensive project, there are plenty of design options that can fit into any budget. If you have an existing structure, you can update them without breaking the bank. Simple repairing any broken or rotting boards can make your deck look brand new. If there are no extra repairs to be done, you can update the aesthetic of your deck or patio. A new stain can bring out natural tones of your wood and bring new life to the wood grain. Depending on the opacity of your stain, it will bring out different natural tones in your wood. They range from transparent which allows the natural beauty of the wood in its entirety to shine through all the way to solid which acts more like a paint. If you want a custom color or a unique pattern on your deck or patio, paint is a great option. You will have to be sure to sand the wood down to ensure that the color permeates the grain. Building a new deck or patio may sound like an expensive project. However, there are plenty of budget friendly plans and materials available to create your new outdoor living space. If you want a classic all wood design, reclaimed wood is a great option. You can refinish the wood to fit into a clean and classic deck design or leave it in its natural state for a more rustic look to your backyard. All of these ideas also apply to a deck or patio extensions. Adding a few more feet to your surface can add an unlimited number of possibilities. Find out how the right outdoor stair can make your outdoor space more attractive and functional. Request a consultation, or contact us directly at 1-800-368-8280. Simple updates to the design can give your outdoor living space new life. If you have a raised deck, consider pouring a simple concrete patio underneath. Under deck patios are perfect for maximizing your outdoor living space. By building one structure, you now have two different areas to entertain in your backyard. Your deck and patio structures aren’t limited to all wood designs. Stamped concrete is becoming an increasingly popular option for patios. Stamped concrete is when the contractor or homeowner pours the concrete and lays a stencil over it while it’s still wet. This usually leaves the shape of individual stones, normally bricks, on the surface of the patio. Their popularity comes from their durability and low cost compared to individually laying bricks. If you want to use individual pavers, but want a cheaper design, consider using gravel as filler between the flagstones. Backyard home design has come a long way from picnic tables and lawn chairs. Outdoor living space ideas aren’t limited to a simple grill and old table. One of the latest trends in backyard home design is bringing the indoors outside. These spaces take inspiration from different rooms in your home to create a unique place for your outdoor entertaining needs without breaking the bank. 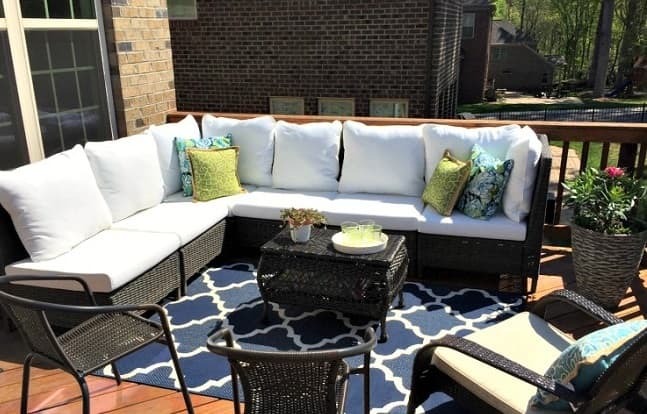 One of the most popular ways to decorate your newly finished space is to create an outdoor living room. This allows you to extend the warmth of your home to your outdoor space and make the most of outdoor entertaining. When it comes to your outdoor spaces design styles, you can choose to use a similar style to your home’s interior or design a completely different space. This can help to create the feeling of a getaway in your own backyard. One unique thing about an outdoor living room, as opposed to other spaces is the idea of bringing traditional indoor elements outside. While some homeowners choose to employ a traditional wicker furniture set, others use a more modern design style with metal frame furniture. These range from couches to armchairs. No matter what style you choose, you need to have comfortable cushions. These are an easy and budget friendly DIY project. Canvas is cost effective and perfect for outdoor applications. It’s durable and can be painted to fit into any design style or color story. Fire pits are the perfect focal point for any outdoor living space. One of the major benefits to a fire pit over other wow factor pieces is the fact that you can use it throughout the year. Unlike a water feature, a fire pit is the perfect centerpiece for a summer campfire or a cool night in early fall. They also add a sense of coziness to your outdoor living room, much like an indoor fireplace. Design accents can help finish out your outdoor living room design. Outdoor rugs are another indoor element that is making their way outdoors. Some may think they’re durable fabrics make the designs bulky and unattractive. However, there is a wide range of designs available to fit your space. If you can’t find your dream rug in your budget, you can always paint one! Just like creating your own textile for the cushions, you can paint a plain outdoor rug to fit into your space. Lighting is also an integral part to enjoying your outdoor living space. Because you want to be able to use your space no matter what time of day, you need effective lighting that won’t be out of budget. One of the best outdoor lighting solutions are rope lights. These string lights are encased in a durable clear plastic tube making them perfect for any outdoor application. The tube is flexible and can be wrapped around a deck railing or the vertical supports of a pergola. No matter what structural design you choose, rope lights will fit into your space. One of the most popular backyard activities is to grill and enjoy the weather while you’re eating. 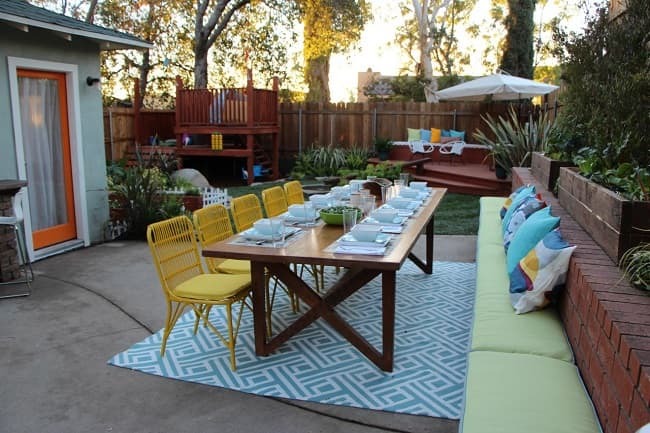 Outdoor dinner parties have been a staple in summer entertaining for as long as people have lived in the suburbs. It’s the perfect way to take advantage of warm weather and spend time with family and friends. While you don’t need to have both an outdoor kitchen and dining area, they usually go hand in hand. Outdoor kitchen designs range in price and extravagance. If you want to keep it simple and within a lower budget, you can easily add extra counter space. A popular backyard DIY project is to create a built in piece around your grill. 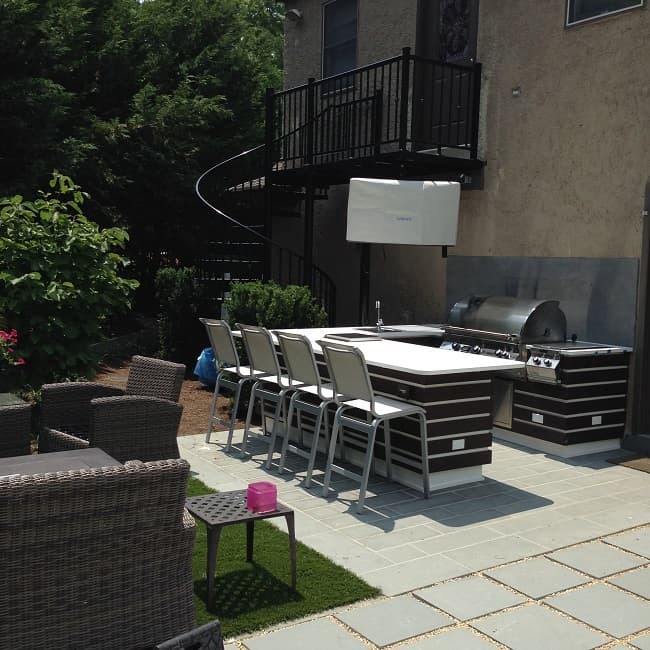 You can achieve the look of a custom outdoor kitchen on your back deck or patio without the high price. The frames are easily made with lumber that you can get from any home improvement store. By building your own frame, you can add as much counter space and cabinets as you need. If you have a larger budget, you can install a mini fridge for the ultimate kitchen feel. Outdoor dining areas are one of the most simple backyard designs for an outdoor living space. When homeowners install a deck or patio, their first thought is to get a table and chairs for their space. Not only is it traditional, but it’s also one of the most budget friendly options. Depending upon the design you choose, there is a wide range of prices. Many homeowners choose to purchase an outdoor dining set that includes a table and matching chairs. You can easily find a wicker set that fits into a traditional deck design and has a range of sizes and shapes. There are also plenty of more modern metal frame tables and chairs. The tables are usually finished with a stone table top and the chairs have cushions that provide a pop of color. For a more eclectic and personality driven space, mismatched furniture that coordinates is a great choice. Thrifted pieces are perfect for budget friendly deck designs. You can refinish the pieces with the right spray paint to create a completely custom piece. For a DIY dining table, use reclaimed wood to build a farm table. If you have enough of the wood, you can build matching benches. These are perfect for large gatherings that require a lot of seating. If you can’t find reclaimed wood, you can use new lumber from a home improvement store. There are wood aging processes that can give your new table the rustic look that you’re looking for. Lighting is a very important part of any outdoor kitchen. You’ll want bright lights that allow for clear visibility at night. This is important for safety reasons around a hot grill and potentially sharp knives. If you decide to separate your kitchen and dining area with a multi level deck design, as many homeowners do, you can have more aesthetically pleasing lights in other areas. Café lights are a very popular design option for dining areas. Café lights are a mix of trendy Edison bulbs and string lights. They are a little dimmer than the bright task lights of the kitchen area, but still fill the space with mood lighting. It adds a finishing touch to your outdoor dining area. While it may be forgotten sometimes, landscaping and your plant choices are just as important as your furnishings! With the right landscaping, you can create a brand new space that’s unrecognizable. It’s like changing your interior floor from carpet to hardwood, it redefines your backyard. Designing and planting a new garden can be expensive, but there are plenty of flower options that can help to fill your space. Perennials, or plants that will bloom year after year, are a great budget friendly landscaping option. Not only are the full of color, but they have one up front cost for the plant. The color stories for your garden can range from monochromatic to a colorful arrangement of different shapes and colors. If you want to add some polish to your deck design, use large plants to cover deck supports. This gives your deck a more expensive look by hiding vertical beams and can add color to your backyard! Don’t be afraid to incorporate potted plants into a finished space. Different sizes and shapes of planters in your space create a dynamic design and can add color to your outdoor living space. You can use them as accents just like you would in an indoor space. Backyards have started to become an addition living room! While many of these designs can be extravagant, you don't have to break the bank to have a beautiful outdoor living space. 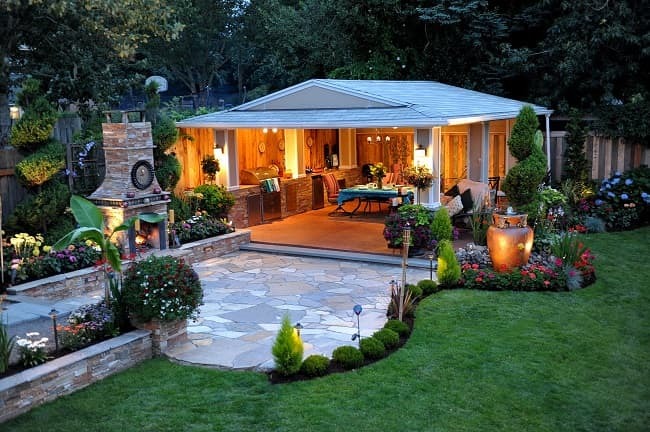 These budget friendly design ideas can help you to create your ideal backyard. No matter what design style you decide to incorporate, you can easily create a unique outdoor living space that you and your friends and family can enjoy.